Dating Aboriginal history is difficult, particularly as it deals with tens-of-thousands of years. Estimates vary from 40,000 to as much as 75,000 years of Aboriginal habitation on the continent. Trying to establish figures for a single area, such as the Camden area, is even more difficult. What is known is that the area was not home to a single language group. This is evidenced by the different names for the region, it being called Baragil (or Baragal) in one language, and Benkennie, meaning the dry land, in another. The region was the intersection of three language groups: the Dharug, the Tharawal, and the Gundungurra. The regions these groups occupied were vast. The Dharug inhabited as far east as Sydney Harbour to Penrith and the Blue Mountains in the west, and south towards the Macarthur region. They were known as the ‘Climbers of Trees’ due to their hunting technique that involved hollowing out toeholds allowing them to catch possums, birds and collect eggs. The Tharawal occupied from Botany Bay to Jervis Bay in the south, and westward to Camden. The Tharawal were also divided into two groups. One was the ‘Salt Water People’ who were along the coast from Botany Bay to Jervis Bay. The other, the “Sweet (or Fresh) Water People’, lived inland towards Camden. The Gundungurra could be found from Windsor in the north across to Lithgow and south towards Goulburn, with what is now the town of Camden being within their territory. The Gundungurra group were known as the ‘Mountain People’. 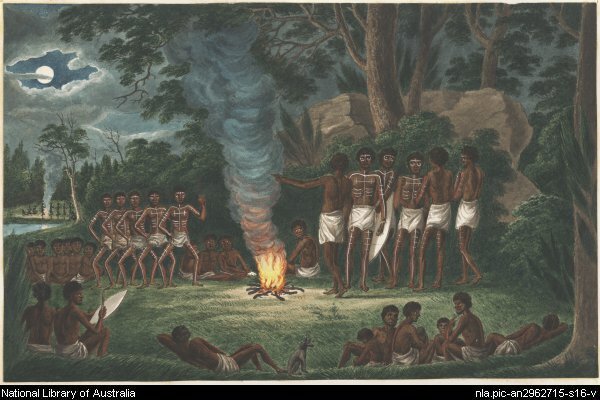 Corroboree around a camp fire by Joesph Lycett (ca.1817). National Library of Australia, an2962715. Language groups consisted from a few hundred to several thousand people. These were spread across clans or bands of around 200 people that controlled a particular region. For example, the Dharug group had two clans in the Macarthur region, the Mundingong people of Narellan and the Cubbitch Barta who used a distinct dialect called Gur Gur. These clans comprised what were called hearth or foraging groups, made up of one or two families. Family groups roamed throughout the various regions and sharing of food and resources was an accepted custom. This made it possible for them to travel without fear of starvation. Inter-tribal conflicts are debated, with some claiming that tribes were hostile to their immediate neighbours but friendly to those further afield. There are others who believe that conflicts tended to be based on individual confrontations, rather than being continuous, deep seated animosities (Organ, 1990). Baragil was a meeting and hunting ground. One resident tells of numerous sites that had importance, such as Crocodile Creek as it was once called, which is now part of the Stonequarry area in Wollondilly. It was a meeting place between the Dharug and Tharawal people. The interaction between the tribes was not only in terms of goods but also to arrange marriages. Thirlmere Lakes was the meeting place between the Tharawal and the Gundungurra people. One of the impacts that European settlement had was taking the land that was the traditional meeting place between the Tharawal and the Dharug people, resulting in the the Tharawal trading more with the Dharug people (Learning from the Past, 2007). Contact between the Aboriginal people of the area and Europeans was gradual. The first traces of the Europeans were supplies, livestock and disease. European goods were traded amongst the Tharawal people of coastal and inland areas. In particular, glass and iron was traded between the Gweagal clan of the Tharawal people who lived on the southern shores of Botany Bay who traded with their inland kin. This clan witnessed the arrival of the First Fleet of 1770 and the 1778 arrival. 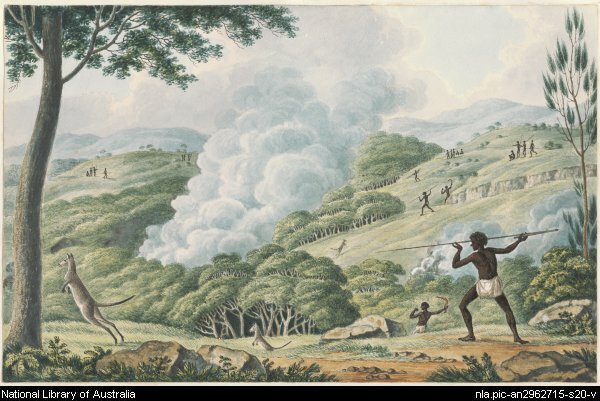 Aborigines using fire to hunt kangaroos by Joesph Lycett (ca.1817). National library of Australia, an2962715. The Tharawal people also witnessed the cattle that escaped from the Sydney camp and wandered into the “Cowpastures“. This is evidenced by the paintings that clearly depict the hoofed animals with horns removed in sandstone shelters along the Georges River, with one even being called Bull Cave, located near Campbelltown. The cattle, when discovered by the Europeans, gained a reputation for being quite aggressive. The Tharawal people also observed this aggressive behaviour. According to Governor King, the Tharawal people would climb trees and wait for the animals to pass rather than engage or hunt them. It is also very likely that the cattle caused the direct contact between the Tharawal and the European settlers to increase, as it was on the search for the cattle that led the settlers further inland (Liston, 1988). Contact between the Aboriginal people of what had become known as the Cowpastures and the European settlers became more regular in the early 1800s. Many comments reveal a degree of admiration of the Aboriginal people. An often quoted remark by Lieutenant Collins describes them as “short, stocky, strong and superbly built” (Wrigley, 2008.). Governor Macquarie too expressed respect for the Aboriginal people of the area, recording during his 1810 tour of the area, a visit of around 15 Aboriginal people who “honoured us (Macqaurie and his companions) with their company and attendance during our stay” (Atkinson, 2008). Macquarie and his party also witnessed the hunting of a goanna and a performance of a corroboree, an event in which Aboriginal people interact with the Dreamtime through music, dance and costume (Mylrea, 2002). You can read about the next stage of Aboriginal history here. Atkinson, Alan. (2008). Camden: Farm and Village Life in Early New South Wales. Liston, Carol. (1988). Campbelltown: The Bicentennial History. North Syd. : Allen & Unwin. Lycett, John. (ca. 1817). Corroboree around a camp fire. National Library of Australia, an2962715. Lycett, John. (ca. 1817) Aborigines using fire to hunt kangaroos. National library of Australia, an2962715. Mylrea. P.J. (2002). Camden District: A History to the 1840s. n.a. (14.9.2007). Learning from the Past. The District Reporter. Wrigley, John. (21.3.2008). The First Australians. The District Reporter.